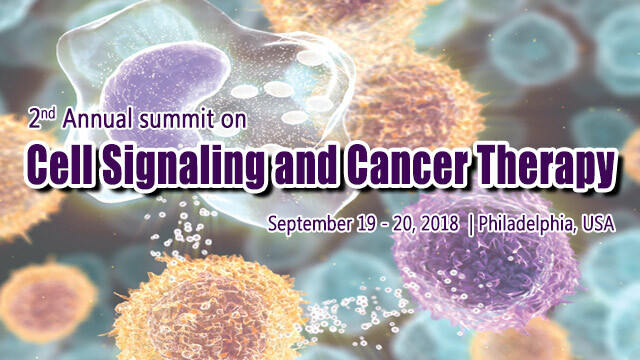 2ndAnnual Summit on Cell Signaling and Cancer Therapy is bustling to be held at Philadelphia, USA during September 19-20, 2018 hosted by Conferences Series. Through the theme "The Scientific Innovations in the field of Cancer Therapy and Cell Signaling", conference will explore the advances in Medical Approaches, Oncology, Translational Oncology, Computational Technologies, Cell Signaling, Cancer biology etc. This conference brings a novel and International mixture of giant and medium cancer therapy and cell signaling analysis, leading universities and cancer analysis establishments creating the conference an excellent platform to share expertise, foster collaborations across trade and world, and assess rising technologies across the world. Why to attend Cell Signaling and Cancer Therapy 2018?